TAM memories, or why skeptics are fun to eat with. My friend, and super teacher Matt Lowry, is just one of many skeptics I’ve enjoyed hanging with at TAM. Visit his blog site, it’s great. However, while at The Amazing Meeting, Matt had a slight “geek accident” with a trick while we were dining. I don’t know if Matt had recently read Penn and Teller’s book “How to Play with your Food”, but I have the feeling he was familiar with it. It’s a great book. Warning, many skeptics at TAM have read this book. The trick Matt was attempting involved those small coffee creamers and a fork. The idea is that it looks like you have stuck a fork in your eye. Instead, the creamer went all over, mostly on our friend Susie who was in the line of fire. It became an even better trick, at least everyone was laughing and talking about it for a long time. Other fun tricks from the book have involved another skeptic friend. He was trying to impress someone he was interested in romantically (so I won’t use his name). One trick in the book involved shaking a can of soda. The trick is that the can of soda will return to a calm state far more quickly than people imagine. You have to time it just right, not so long that people won’t duck when you open it, but you do have to wait a few moments. His timing was off, and while she did duck, she was still sprayed with soda. She just LOOKED at him. The other skeptics at the table tried to explain the trick. Still, when he asked for a date later she turned him down. I’ve also had the bleeding heart brought to skeptic events. You cut into this heart shaped dessert and it bleeds. All over the tablecloth. When someone brings this surprising and delightful treat to a party, I rush over to put a bigger dish under it before cutting. The dish catches any overflow. Buy the book, read the directions carefully, and laugh when the trick doesn’t quite go as planned. This is still one of my favorite TAM memories, the look on Susie’s face, and also the look on Matt’s face when it went just a little bit wrong. I was at that lunch with Matt & Susie, it was a very funny moment. 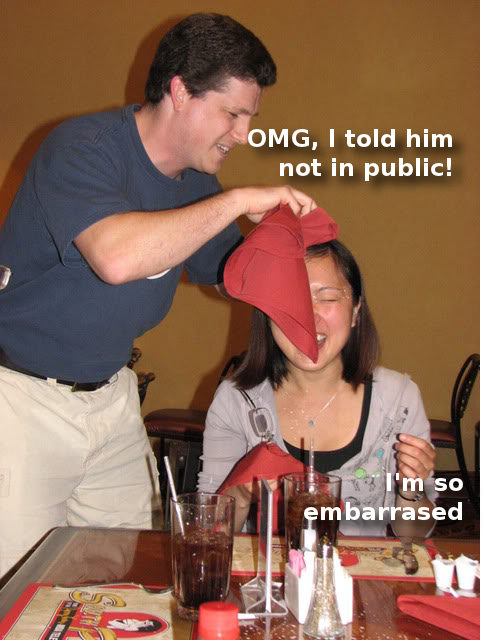 Matt was embarrassed.